John testified about [Jesus] when he shouted to the crowds, "This is the one I was talking about when I said, 'Someone is coming after me who is far greater than I am, for he existed long before me.'" John the Baptizer was courageous. John was passionate, but he realized he was just a "pointer" — someone who directed people to someone far greater than himself. Jesus was in existence long before John appeared on the scene. In fact, Jesus existed before creation. No matter how important others viewed him, John knew God had sent him to earth with one primary job: Point others to Jesus, the preexistent "Word" of God! In a world full of people obsessed with getting their fifteen seconds of fame, John is a breath of fresh air. 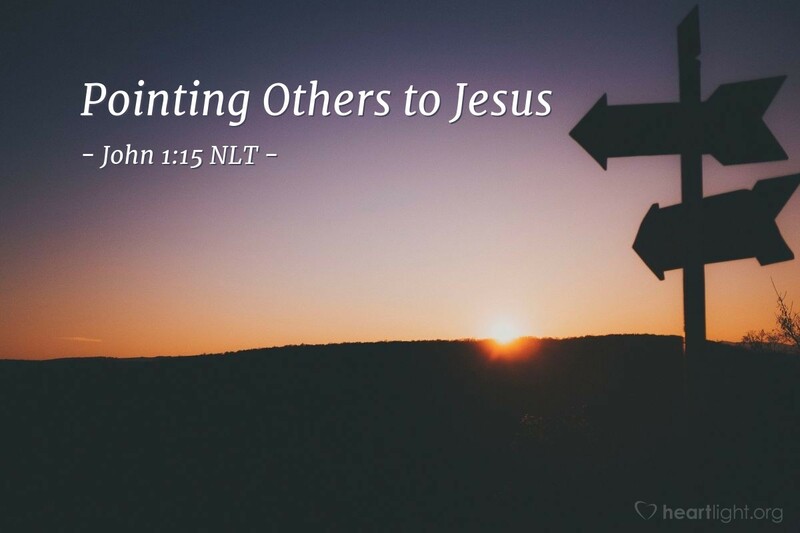 His life challenges each of us to ask an important question: Will I spend my life helping others know of Jesus' greatness rather than having them focus on me? Father, please help me find and fulfill my role as John did — to point others to Jesus and his greatness and grace. Help me find great delight in doing what you created me to do and using my influence to help others to see Jesus. In Jesus' name. Amen.